"Emeric is the Cherrystone Kingdom's royal mage. He channels powerful magic through his set of cherrystones." Emeric is a commander in the Cherrystone Kingdom. He is the Cherrystone Kingdom’s royal mage, and a close friend of the late King Mercival II. He now finds himself tasked with guiding the newly crowned Queen Mercia through her royal duties. Emeric channels powerful magic through his set of cherrystones, which he unleashes in a powerful bolt of energy when attacking. Emeric is an immensely powerful mage, well versed in arcane lore. He is a scholar, and his knowledge, alongside his tactical know-how and compassionate wisdom, have made him an indispensable advisor to the Cherrystone throne. Beyond that, he is a kind (if reserved) individual, who cares fiercely for the late King Mercival and his daughter Mercia. Emeric is the youngest son of a noble Cherrystone family. His siblings, twins, were 15 years his senior, which meant that he had a somewhat solitary childhood. He took refuge in his studies, and devoured books voraciously. From a young age, he showed a deep interest in, and talent for, the arcane magical arts. He was a dedicated student, who soon outstripped his tutors to become the leading mage of his generation. Emeric's Groove is Elder Shield, in which he deploys a magical gem that provides a defensive bonus to all nearby friendly units. 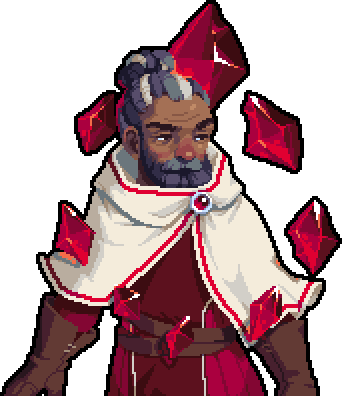 Elder Shield can be used offensively and defensively, as any friendly Alchemists within range will have their critical hit condition activated unless on a river or beach.. The gem should be placed in a difficult to reach position. The Elder shield effect provides +3 terrain defense (to a cap of 4) to any friendly unit in range. The effect is not hindered by any type of terrain. It does not affect buildings but it does affect air units. The Elder shield is a Crystal unit. It loses 20% health each turn automatically. It can be attacked but does not counter-attack. The crystal is affected by the terrain defense of the tile it is placed on. Emeric is voiced by Jason Marnocha. This page was last modified on 24 March 2019, at 01:57.